All good things must come to an end, and all bad things must come to an end quickly. If you’re stuck at a job that doesn’t appreciate you for your skills and work ethic, or if you’re ready to take the plunge into a different career path, it’s time to write a resignation letter, which is just one of the many types of business letters. But first, why is it important to write one? You are quitting, after all. Who needs ‘em!? Just to be safe, I recommend writing a resignation letter no matter how formal or informal the job was. My first job was as a hostess at a Mexican restaurant. I was 16 and picked up the role for some extra summer cash. Once the school year began, I became too busy with after-school theatre rehearsals and had to let go of my commitments to the restaurant and its customers. My parents had me write and turn in a two-weeks notice letter. I had chosen to leave the company on my own volition and wanted to make sure we maintained a good relationship. As a teenager, I knew it was important to have viable references on my resume. Not only was a letter of resignation good professional practice, but it meant my hard-earned connections would be more likely to speak positively of my performance later on. I went on to work at Sonic Drive-Thru the next summer (no, I did not rollerblade), and believe you me, that reference really meant something to my new manager. The two-week notice rule is not always best practice for employees who are being mistreated. If you’re leaving a company that has not cared for your well-being, it’s likely your resignation will be immediate. This is something worth thinking long and hard about. Do you need that reference later on? Or do you have a new job lined up and you’re all ready to walk out the door? While hate-quitting can feel great in the moment, you’re the only one who can judge whether it would come back to haunt you or not. Either way, a letter is a good idea. It serves as an in-writing notice of why you are leaving and can also protect you in the event of untrue accusations or in the future when recruiting teams may reach out to use a previous company as a reference. I do not hope for this situation for anyone (I’ve certainly had my own negative experiences in a toxic work environment), but I know it happens, and it’s better to be prepared than penitent. So, if you’re ready to leave that old nine-to-five (or any other combination of hours; I understand the hustle takes many forms) behind, grab a cold brew or a glass of wine (depending on the circumstances) and learn how to resign with dignity. Any letter of resignation should begin with the date written and address of the company at hand. The date in which the letter is written is especially important, as you’ll be including your final date of employment in this letter later on. Having the date written listed at the top of your resignation letter serves as a reliable reference for when you notified management of this change. Should there be any unfortunate discrepancies about when your last day is, you can reference the letter as proof of your due diligence. If you are writing a resignation email, the timestamp is already included. However, if you want the date to stand out as an important aspect of your resignation, feel free to include it in the body of the email. It is also recommended to include the name and address of the company in the header, regardless of whether it is an email or hardcopy. You are most likely handing this letter directly to the related personnel, so it can feel silly to include a mailing address. The address is a time-honored tradition of resignation letters that also serves to specify exactly which company you are leaving. Again, when it comes to leaving an organization, better to be specific than sorry. When beginning a letter of resignation, keep things formal, yet amicable. Even though you’re quitting, your letter of resignation can still sound like it’s coming from you. Begin with a “Dear Mr./Ms./Mrs. BOSS NAME,” “Dear COMPANY NAME,” or even a, “To whom it may concern,” if you’re not sure who will be handling the letter. If you know your boss or manager well, refer to them by their first name instead of their last. With a resignation letter, you’ll need to get right to the point. The first paragraph should clearly denote that you are leaving the organization. It will probably feel unnatural writing a sentence this blunt and straightforward. You would never speak to a friend or family member this formally. However, it’s important not to mince words. If you’ve come to the decision that you are leaving and cannot be convinced otherwise, your letter should make that clear. Otherwise, there may be some confusion as management tries to drum up ways to keep you around. If it’s a higher salary or promotion you desire, you should have that conversation with your boss prior to a letter of resignation. Only submit a letter of resignation when you’re certain you’re ready to move on to other opportunities. After notifying management of your leave, you’ll need to clarify your final date of employment. The standard notice for most organizations is two weeks, or more depending on special circumstances. For example, if you’re in the middle of a long project, you may tell management you’ll stay with them to finish it out. If, for some reason, you need to quit prior to two weeks in advance, outline that reason here. You don’t have to go into great detail. If, for example, you need to leave to care for an ailing relative, that’s private information that you don’t have to explicitly say. You could instead choose to tell your boss you are leaving prior to the standard two-week notice due to unforeseen emergency circumstances. Regardless of the length of your notice, be sure to include an exact date for when your employment will end. Providing this final date is important for many reasons. For one, it’s another way to definitively communicate to your management team that you are leaving. For another, it allows management to better prepare for your absence. With an exact date in mind, they can understand what work is possible to accomplish, and what all will remain after you’re gone. If you’ve worked at a company for six years or so, it’s possible your managers and co-workers are more than just that. Perhaps they’re your friends, or they’ve watched your kids, or you co-own a sailboat (weirder things have happened). If you want to let them know what your next steps in life are, include that in this next portion of your letter of resignation. Humans long for closure, and stating why you’re leaving lets your managers know if the working relationship is ending on a good note. “After many enjoyable years at CURRENT COMPANY, I am leaving to pursue a full-time career in music." Ideally, your company cares about you and is happy that you are taking your next steps in life. A corporation is not a person, so remember that quitting is not the same as a break-up. It’s easy to feel guilty leaving behind the projects you were passionate about and the people you grew to love. At the end of the day, however, we have to take care of our own best interests. If the working relationship is not ending on a good note, you may choose not to go into extensive detail. That information may be better suited for an exit interview. Everyone’s relationship with co-workers and management is different, so adjust your letter of resignation accordingly. You do a lot for your company. When you’re gone, there will undoubtedly be a gap where your hard work once was. Although it’s not your responsibility to worry about the company after you’re gone, it’s a nice gesture to offer some help with the transition throughout the duration of your notice. If the company is planning to hire a replacement, this offer might be impossible. The hiring process can take weeks to months, and you’re not going to stick around for that long. But, if there are other employees on the team who could reasonably perform your job or parts of your job, managers may appreciate an offer to spend some of your final days at the company training those colleagues. Again, this step is optional. It’s a gesture that shows you’re willing to go out of your way to help with the difficulty of your leave. This step is recommended mostly to employees whose roles are specific and whose skills are difficult to replace. If you’re working part-time at a role with a high turnover rate, there are likely frequent training sessions already set in place. In that case, it is not your responsibility to help the company adjust to your absence. An integral part of a letter of resignation is this next section wherein you thank the company for all that it has done for you. Even in my role as a teenage hostess, I was grateful to that restaurant for helping a young high-schooler build her resume and skills. Additionally, this part of the letter of resignation is great for maintaining that positive relationship we talked about. You get to reinforce your appreciation for the opportunity and end things on a good note, or, more literally, a good letter. This section is an opportunity to get more specific with some of the things you have appreciated about this job. It also communicates to management that you’ve had a good experience and gleaned wisdom from the role. Again, this section is not the place to air your list of complaints. Plus, with this screenshot-and-share internet and social media culture, you’ll want to be careful about what you put in writing. You do not want a moment of fury to be the letter that gets shared across all of Twitter, especially as you’re entering a difficult job market. Regardless of your experience at work, it could make a huge difference in your professional relationship if you’re able to muster up some positive things to say about the role. At the end of the day, you never know when you’ll need to use a role, company, or manager as a reference to get another job. As with any essay or letter, you’ll want to end with a polite conclusion. This doesn’t have to be anything fancy or lengthy. It’s just a way of neatly wrapping up everything you’ve said. If you had a closer relationship with your boss and/or colleagues, feel free to make this section slightly more personal. Keep it formal, though. Resignation letters are not the place to write an emotional poem regarding the way the sun shines into the kitchen on Taco Tuesday. Although, that would make for a great goodbye card. If you had previously offered to train colleagues or new employees, now would be an okay time to restate your intentions to do so. This may seem obvious, but be sure to sign your name at the end. This confirms you as the sender, confirms the end of your letter of resignation, and serves to make the letter more personal. Be sure to end the letter with a closing greeting, such as, “sincerely,” “warmly,” “regards,” or something along those lines. The word you choose can, again, reflect the relationship you have with this company and its employees. Looking for a starting point to write your resignation letter? 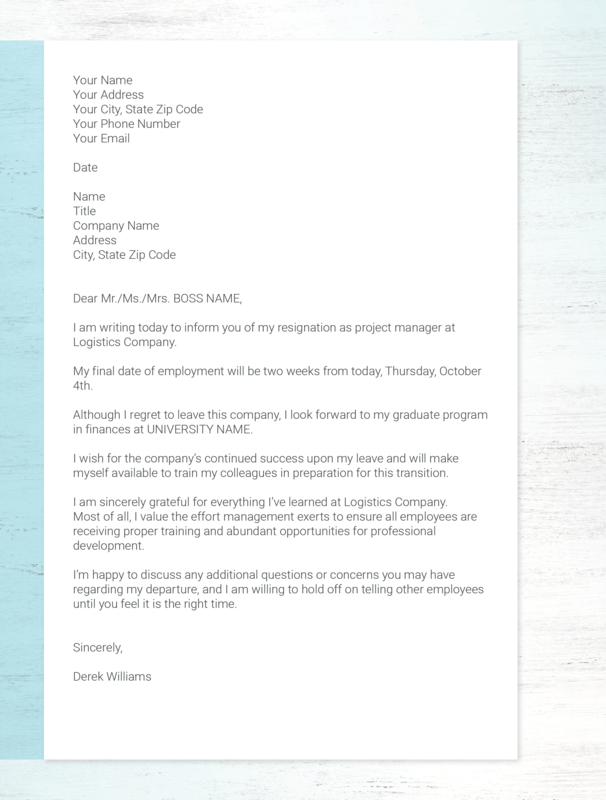 We've put together this handy pre-written resignation letter template for you to download and use with your employer. Change is scary, and leaving a place you’re comfortable at, or maybe just comfortably provided for at, can be scary. We all know how hesitant Pam was to leave Scranton and follow Jim’s new startup in The Office. We grow roots, and they get harder and harder to dig up. But change can be really, really good. So good that it just made a writer use the word “really” twice in a professional article. Change means new faces, new friends, and new opportunities to explore. If you’re feeling like it’s time for something different, maybe lean into that feeling. Determine why you feel that way and if it’s time to pursue other interests. Then, when the time is right and your path is moderately laid out (it will never be perfectly laid out), write up one of these letters of resignation. Am I encouraging everyone reading this to up and quit their jobs to pursue their bliss? Off the record, yes. On the record, no. I’m saying that you shouldn’t remain somewhere static simply because it’s comfortable. If it’s time to go — and if you’re reading this far, it might be — you should be on your merry way. And, just like that, you’re off to find the next best thing.